EXTECH Inc. is proud to announce that we will now be integrating Palram’s SUNGLAZE™ canopy into our product offering. 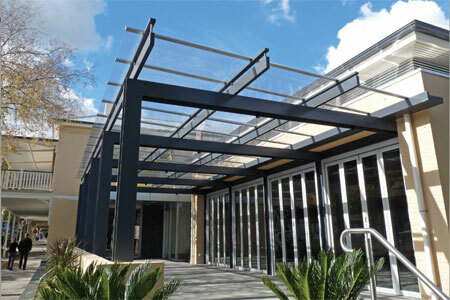 The SUNGLAZE™ canopy system offers smart design, elegant appearance, versatility and low maintenance. SUNGLAZE™ compliments EXTECH's current range of polycarbonate canopies by offering an architectural system that incorporates a proprietary standing-seam profile panel that offers wide spans and a sleek edge appearance. The beauty of SUNGLAZE™ is that continuous sheets can be specified in lengths up to 40' to match even the most creative of structural designs. In addition to enhancing a building’s appearance, SUNGLAZE™ meets demanding performance specifications. Other benefits include standing seam leak-proof performance, free thermal expansion, caulking and silicone free, withstands high-loads, fast, easy, and safe installation, as well as minimal maintenance–SUNGLAZE™ is easy to fasten; the panels are simply joined by an aluminum profile set that is enclosed at the ends by enclosures. Screws lock the system and fix it to the structure without any penetration through the panels. The Cap-plug completes the assembly, covering the screw head and provides a smooth appearance from above. Kineticwall Chosen as Finalist for the Architizer A+ Awards!